Hi Everyone! We know we have not been around as much as usual these days, and we miss posting about things going on in our lives and yours like The Minimalist Challenge (update coming soon!) and Vacations (more on this next sumer!). So, where have we been? 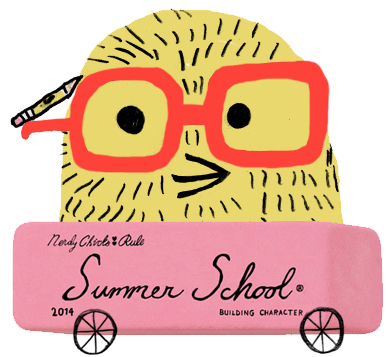 You might remember that we started a sister blog with a writing theme called NerdyChicksWrite.com and over there we hosted the first ever Kidlit Summer School where twenty-four authors gave writing advice on one theme: character development. The good news is that it was more successful than we anticipated, and was even covered in Publisher’s Weekly. The bad news is that it took WAY more time than we thought to run it! Read the Publisher’s Weekly article about Kidlit Summer School HERE or visit the BLOG to see posts on character. Still, we loved the experience, especially since writing and teaching are two of our favorite things. Sudipta talks about this in a guest post over on Tara Lazar’s blog: How Teaching Makes You Better at DOING. (She’s doing a giveaway too until the 16th. Check it out!) And Kami teaches a little about writing this week on the Writer’s Digest blog. (Another giveaway too!) Now we’re embracing teaching writing on a new level with Kidlit Writing School. If you are interested in writing a novel or a picture book, check out these courses. There is a free webinar on Monday, open to anyone, whether or not you take the courses! And we have sign-up specials running until September 20. Classes start October 6. These include critiques from Sudipta and I as well as a chance to win a critique from agent Rachel Orr. You can read all of the details HERE on our home page. Picture Book A to Z’s: Plotting in Picture Books: The ability to craft a strong picture book plot is one of the factors that separates unpublished writers from those who consistently sign publishing contracts to see their work in print. This course will teach you the essentials of creating compelling plots, starting with Arcs, Beginnings, and Climaxes — then literally taking you through the alphabet. Each topic will be explored in depth, both in the lessons and in the discussion forums and webinars. The writing exercises that are a part of of the course are designed to help you apply the lessons to your own writing seamlessly and immediately. By the end of the course, you will never look at plotting the same way again! Crafting the Kidlit Novel ​One Bite at a Time: How Writing a Novel is Like Eating a T-Rex and Other Things That Bite Back With Children’s Authors Kami Kinard and Rebecca Petruck :In today’s competitive market, a manuscript must be compelling, demonstrate deep knowledge of the category, and be of highest quality in order to attract an editor. This course will teach you how to dig deep into what your novel is truly about with specific exercises designed to bypass the superficial ideas and get to the heart of story. Further lessons will help you create main and secondary characters readers will feel passionate about; structure your plot to build maximum tension; practice the craft of writing itself; and coach you on how to write to the end. It’s a lot of ground to cover in one month, but fun lessons, practical exercises that apply to your own writing, forum discussions with your peers, and weekly webinars will keep your energy high as you craft your kidlit novel. We’ll wrap up the course with a discussion of today’s kidlit market and where we think your projects might fit into it. Now that Summer School is over, we’ll be back with our regular blogging too. Coming next week: Back to school advice from our blog guests! See you soon! This entry was posted in About Writing and tagged character development, children's author classe, Kidlit Writing School, teaching writing, writing classes.